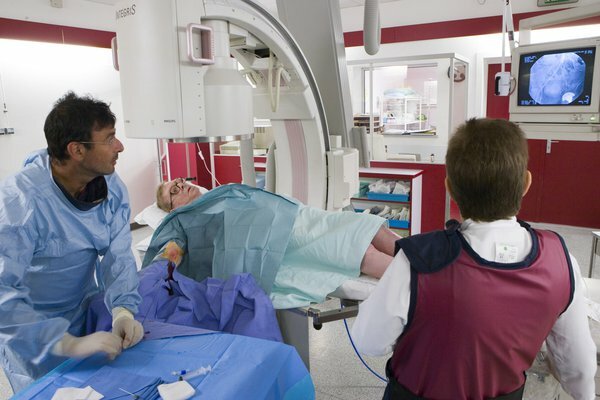 Angiography is carried out in a hospital X-ray or radiology department. It normally takes between 30 minutes and two hours, and you can usually go home the same day. Before having an angiogram, you may be asked to attend a hospital appointment to check that you can have the test. If you choose to have a sedative, you'll be asked not to eat for a few hours before the test. You'll also need to arrange for someone to pick you up from the hospital, as you won't be able to drive yourself home. You'll usually be awake for an angiogram, although general anaesthetic (where you're asleep) may be used for young children. Sometimes treatment may be carried at the same time, such as inserting a balloon or a small tube to open up a narrowed artery. This is known as angioplasty. Once the procedure is finished, the catheter is removed and pressure is placed on the cut to stop any bleeding. Stitches aren't needed. After the test, you'll be taken to a recovery ward where you'll be asked to lie still for a few hours to prevent bleeding from the cut. You'll usually be able to go home the same day, although sometimes you may need to stay in hospital overnight. It may be possible to tell you the results of the test before you go home, but often the X-rays need to be studied in detail and the results are not available for a few weeks. You will probably have some bruising and soreness for at least a few days.